“That chicken did everything but talk!” says Joe. The Chicken Man’s real name was Anderson Punch, but he went by Casey Jones, after the song he sang most often, for much of his life. Born in 1870, he came to Chicago around 1914 and went to work as a street musician. After his accordion broke, he took up training chickens. At any given time, he had three or four trained chickens, traveling around the city having them do tricks and dancing to his accordion and harmonica. He was a well known figure around the city for more than half a century; when one of his chickens died, there was a public funeral at a vacant lot on State Street. On more than one occasion he was hauled into court for one reason or another (usually obstructing traffic) and got out by having his chickens do their act. In 1971, he was still performing on the south side when he celebrated his 101st birthday. He died in 1974. One interesting thing to note is that he hit every corner on the south side, but, as of the 1940s, said that his favorite place, financially, was at 63rd and Halsted – only a couple of blocks from the site of the H.H. Holmes murder castle. Imagine standing outside of the castle (which was still standing until 1938) and watching a dancing chicken in front of it – how surreal can you get? 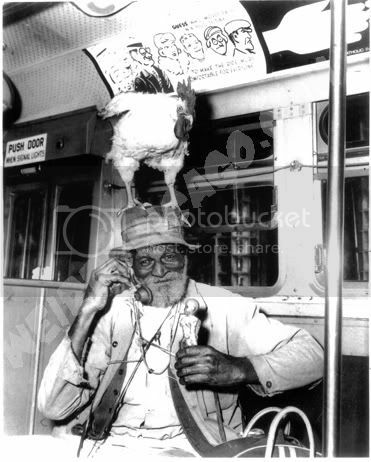 Look for more on the chicken man and other such Chicago icons in our upcoming book – up for pre-order soon! Actually, there is! Scroll back to some previous entries in the blog, and there are two film clips from about 1964 (act which point he would have been 94 years old! ).